Someone is knocking on my office door to ask my opinion on new enrollment marketing materials. Next to me, an exhausted first grader is snoozing on a bean bag chair. My board chair is texting me about our upcoming meeting. Our charter renewal application is waiting in my inbox for review, among 33 other unread emails. This is not a scene from a former job of mine; it’s from a couple of weeks ago. I’m currently serving as Interim Executive Director for a single-site charter school for which I’ve been a board member for a few years. It’s a role that I’m thrilled to be filling, and one that gives me particular empathy for my current clients, as I toggle between school leadership at my charter school and school advising at Bellwether. At Bellwether, we are about to launch our tenth Strategic Growth Institute (SGI), a four- to six-month-long cohort-based experience in which single-site charters, small charter management organizations (CMOs), and district schools develop strategic plans that enable them to reach more students. 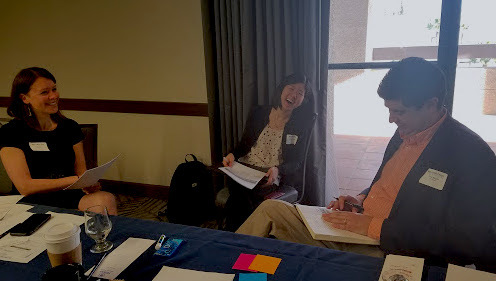 I absolutely love leading SGI cohorts, and I’ve seen how useful they can be for participants. School leaders don’t always have time to step out of the day-to-day to think longer term about their work. But to successfully grow and avoid common pitfalls, they’ll need a three-to five-year view and some intentional planning. That’s where Bellwether comes in. I get to guide leaders as they develop a plan that is uniquely theirs, one that mitigates the breadth of challenges that small, scaling organizations often encounter. Concurrent with our tenth SGI, we’re launching a series of blog posts on the challenges of school network scaling, from clarifying the vision for the future to creating an actionable implementation plan. This series will answer common questions we address as part of our SGI planning process. You can follow along over the coming months to read more — we’ll use the hashtag #SGInstitute here on Ahead of the Heard and on Twitter. If you’re interested in learning more about the Strategic Growth Institute and whether it’s a good fit for your school, contact my colleague Rebecca Gifford Goldberg. This entry was posted in Charter Schools, School Leadership, Talent and tagged #SGInstitute, CMO, scale, Strategic Advising, strategic plan on September 10, 2018 by Stephanie Wilson Itelman.